Legacy Academy is having a Mother’s Day plant Sale. There will be a plant sale at school May 10th and 11th, so please let your children know they can purchase plants and flowers at that time as well!! If you are interested in placing a pre-order please contact Mollie Holm ASAP @ mollie.holm@legacyk8.org. There are several more kinds of plants to choose from. Thank you for your continued support of Legacy Academy!!! Due to the recent bad weather, the carnival and reunion have been rescheduled. It will be held on Friday, May 19th from 2-6 pm. What a great way to end the school year. 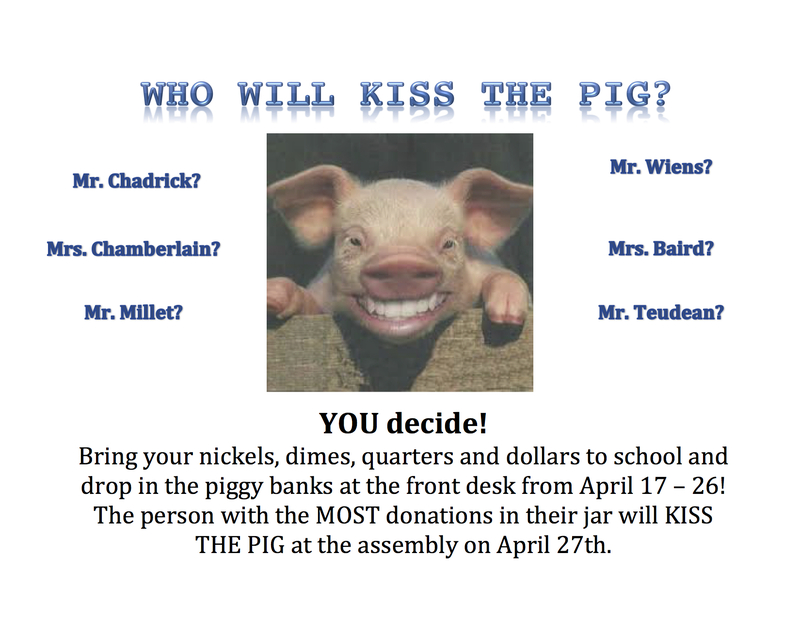 We would LOVE to have all of your support with this fundraiser! We are monitoring the weather for this weekend and we will let you know on Wednesday if we will make other plans for the Carnival. 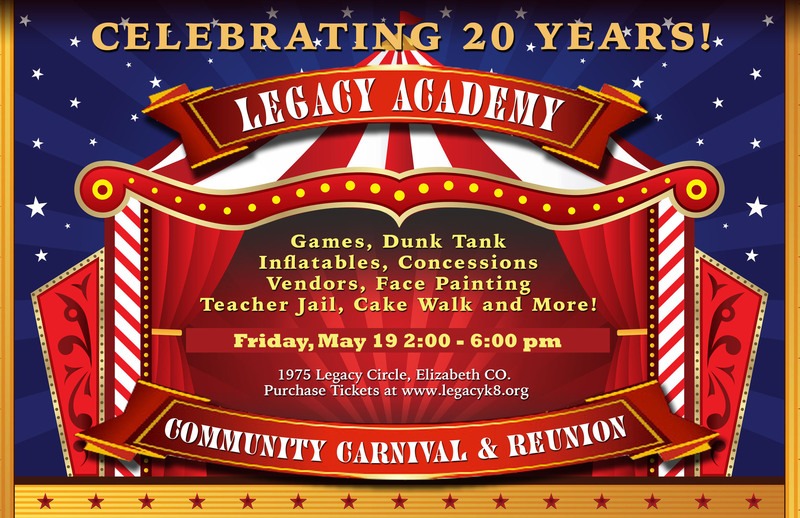 Come join us at our Community Carnival at Legacy Academy on April 29 from 12:00 – 4:00 pm. There will be fun for all ages. We will have large inflatables, a dunk tank, carnival games, face painting, a cakewalk, food, and local vendors. Purchase your tickets early for a great discount. (Admission is FREE, Games require tickets/wristbands.) You can pick them up at the will call booth and avoid the lines! (All sales are final) Should there be bad weather we will reschedule for May 19th 3-7pm. Wednesday, April 26 – An author named Linda Reincke will be in the building to read to students K- 5th. She will have books available to purchase, more information to follow. The summer months are soon ahead. Time for backyard barbecues and family vacations. It is the perfect time to use your Safeway or King Soopers reloadable gift cards while supporting your student’s education. On the average, a Fourth of July picnic runs $120.00 for 20 people. If 100 households use their grocery cards alone, $600 would be raised for teacher grants. If those families than used their cards each month for a year, $7200.00 would then be raised – from just 100 households! These funds are community giving that come directly from the store and not from your pocket. It’s as simple as putting the money you would spend on one of our gift cards just prior to making your purchase, then use the card to buy your groceries! This additional step supports only the Elizabeth C-1 School District providing thousands of dollars in funding. Our grant program allows teachers to think outside the box funding a slam poet, elementary level programmable robots, just a couple of examples of the many items funded by the foundation. These would not have been available to our teachers, but especially our students, without your support, and the support of others like you. Cards must be purchased from The Elizabeth Education Foundation. Order forms are attached. The following students won their classroom spell-off competitions and will advance to the K-3 Spelling Bee scheduled for Wednesday, May 3, at 8:20 in the Legacy gym. The Board election that was scheduled April 20, 2017, has been canceled. For this cycle, there was one board seat open and the board member who currently holds this seat has submitted a letter of intent for the available position. Since this individual was the only person to submit a letter of intent prior to the deadline, the Board has accepted the intent and has determined that an election is not needed for this spring.